A feline problem that we encounter in predominantly outdoor, white haired cats is a cancer called Squamous Cell Carcinoma (SCC). This is a serious disease, but if caught early there is so much more we can do about it. Vigilance on your part is the key to noticing any abnormalities warranting an exam by one of our doctors. The skin version of SCC is caused by excessive amounts of sunshine, so the disease is prevalent here in California. White haired cats have more than a 13 times greater risk of getting this disease than do cats of other colors, due to their lack of pigmentation. The oral version of SCC is particularly aggressive as opposed to the skin version of SCC in white haired cats. 90% of cats with oral SCC are dead within 12 months of diagnosis. At the end of the surgery pictures (don't worry, they're not bad) is a short video on using the laser to correct this problem. The laser is our preferred method of treatment. You need QuickTime from www.apple.com to get it to play. This is a particularly aggressive form of the disease that has unique biological behavior. The oral version of SCC can occur anywhere in the mouth or jaw, and only occasionally spreads. Under the tongue, called the sublingual area, is where it is found most often. Many other tumors tend to be found in the lungs when they spread. This is not the case for oral SCC. If it spreads it is oftentimes found in the submandibular lymph on the same side of the mouth as the tumor. These tumors grow rapidly and are usually well entrenched by the time a diagnosis is made. At this stage the prognosis is poor, so early detection is vital. This as another affirmation of the need for complete physical exams in cats, especially as they age. Older cats need frequent exams to catch this disease and other geriatric diseases before they have progressed too far. The average age of cat with oral SCC is 12 years, although it has been diagnosed in cats much younger. It can occur in most any breed of cat. One year survival rate is less than 10%. Typical symptoms might include halitosis, difficulty eating (dysphagia), and drooling, although being the mysterious creatures they can be, the oral SCC can be present without any outward signs. 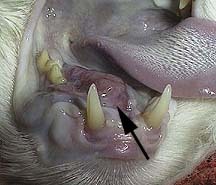 The oral cavity is a common site for SCC, accounting for 10% of all feline tumors. This cat has the tumor under its tongue. At this stage of the disease these cats might only live several months after diagnosis. This cat has it on its lower jaw (arrow) on the right side. The diagnosis was verified during a biopsy while its teeth were cleaned. SCC can mimic tooth root abscesses, so biopsies are recommended if we suspect it while cleaning your cat's teeth. A closeup view shows how extensive the problem is. The only treatment at this point is to remove this side of the whole lower jaw. This is called a mandibulectomy. If the problem is in the tongue chemotherapy can be used to prolong life. Radiation therapy can be used if the problem is in the upper jaw. Neither treatmen is rewarding. We recommend a feeding tube in these cats to aid in their nutrition. 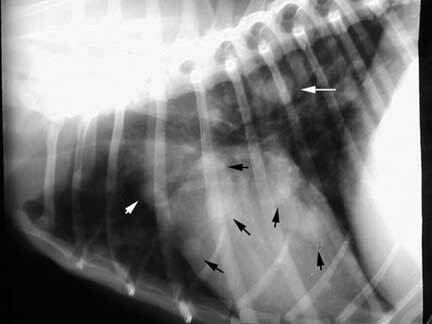 The radiograph of this cat shows how extensive the lesion is. There are two areas to note on this view of the lower jaw. The right jaw bone is affected. It has a moth eaten appearance that can be visualized by comparing it to the left side of the jaw. In addition to the bone lesion, the tissue of the mouth surrounding the bone is also affected. 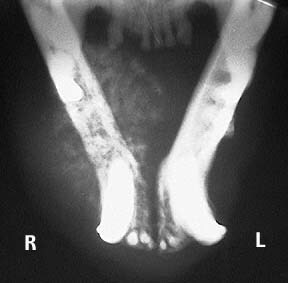 This is visualized on the radiograph as the whitish area surrounding the right jaw bone. This is the tissue that was biopsied to confirm the diagnosis. at this stage of the disease the jaw on the affected side needs to be completely removed. 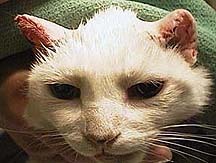 In the skin version of SCC white haired cats usually get the problem on the ears, head, eyelids and tip of the nose. 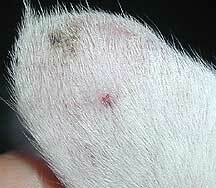 Cats that are not white usually develop the lesions on unpigmented areas or areas of sparse hair. It occurs mostly in older cats, but the age at which it occurs depends on each individuals' amount of exposure to sunshine and lack of pigmentation. Lymph nodes affected with SCC can be normal in size, as opposed to lymph nodes with other cancers, especially lymphosarcoma, that can become substantially enlarged. On another note, an enlarged lymph node in a cat that has oral SCC can be negative for the tumor in the lymph node, and is enlarged for some other reason. The bottom line- a physical exam only checking the external lymph nodes by palpation is not adequate to determine spread of the oral SCC. An FNA or biopsy of the lymph node is needed. Cats with SCC, especially the oral version, are in pain and can be in poor nutritional state. We determine this with a routine blood panel examination. Before any surgery we institute pain control and supplemental feeding, including a feeding tube if necessary. If the lesion is on the nose or head a great effort is made to preserve a cosmetic look. Again, this emphasizes the need for an early diagnosis. If the lesion is on the ear then a partial amputation of the ear is performed. It is important to remove a significant amount of the ear because recurrence is common if the amputation is incomplete. The redeeming part of this surgery is the fact that most cats look great when healing is complete. Some SCC lesions are very extensive. In a case like Ashley's, we have to amputate almost the whole external ear due to the extensive nature of the lesion. We prefer to care for these situations long before they become this extensive. This cat has been positively diagnosed with SCC on both of its ears, even though the problem only seems minor compared to Ashley. The small amount of redness and the minor scabs are the only apparent lesions. It is under general anesthesia, has been prepped for surgery and the amputation of both ears is about to begin. The following pictures are from an actual partial ear amputation that we performed at our hospital. If you do not want to view them click here to see the ears when they are healed and to continue learning about SCC without looking at the actual surgery. Since it is impossible to determine just how far the tumor has spread, wide margins are cut to minimize the potential for recurrence. This is the appearance of the ears immediately after surgery. The look longer than they actually are because the hair around them has been clipped extensively. Within 7-10 days these sutures will be removed. Four weeks later this is the final appearance. Many people do not even notice that any surgery has been performed. It is important to keep this pet out of the sunshine indefinitely. When we remvove the jaw (mandibulectomy) on the affected sid of oral SCC there is the potential for postoperative complications. These include excess salivating, inability to drink or chew (masticate) properly, and difficulty grooming. This surgery tends to be more successful when the tumor is small and located towards the front of the jaw. 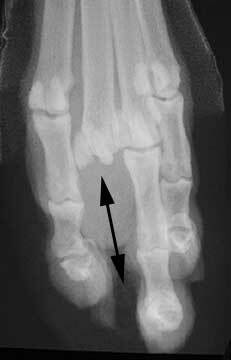 This dog has SCC at its toe (arrow). You can see how the bone is being destroyed. We amputated the toe all the way up to the metacarpal joint. The arrow points out where the toe used to be. 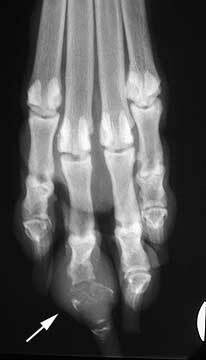 This radiograph looks different from the one above because it was take immediately after surgery and there was a bandage on the foot. A potential treatment for SCC is called Photo Dynamic Therapy. It involves the use of a laser beam to selectively destroy cancerous tissue only. An injection of photosensitive chemical is given to a pet that has SCC. The only cells that absorb this chemical are the cancerous ones. It is only these cells that are destroyed by the laser, the laser beam harmlessly passes through the normal cells that do not absorb the photosensitive chemical. If one of our doctors feels that this therapy is appropriate, they will let you know. It is considered experimental therapy, and is performed locally only at the Beckman Laser Institute at the University of California at Irvine, on a referral basis only. Older cats need exams at least every 6 months to aid in the early diagnosis of the other forms of SCC, especially the oral form. Our online store can provide you with pet products and prescriptions that are competitive with any online organization, along with the added convenience of pre-approval by our doctors and products that are safe and effective, backed by the manufacturer's guarantee.